Long talk with A.D. Williams at Malacañan about the reorganization of the government. He gave me a chart showing a reduction in the number of the provinces, based on topography and roads –which would save nearly half of the expenditures on provincial governments. We discussed many bureaus and buildings for the same. He said that the retirement of surplus officials as proposed by the law of two years ago was not carried out. I asked him if he would serve on a committee to work out a plan, if I could get Palma also? He consented. Saw Quezon for one hour in Pasay –says he has had frightful pains in his stomach, and thinks that milk does not agree with him; therefore, he ate a dinner of oysters, fish, chicken, four vegetables, and a sweet! An awful diet for stomach ulcers! Then he became very natural and lively. Said his 1st pardon had been for adultery, and that he would not allow a man to remain in prison for an offense he had so often committed himself. I told him he must cast responsibility for administration on his cabinet –said he proposed to do so, and that is why he has just announced the rule of only two cabinet meetings a week, because they had fallen into the habit of not giving an increase of salary to an employee without cabinet consent. I told him there was much corruption in the government. He agreed and said that was why he had jumped so hard on the Director of Commerce, in connection with the importation of rice –as a warning to all minor employees. We arranged a program for a committee to reorganize the government. Then I asked him about nationalization of industries. He said they must do it; but should begin by an economic review, and then inform the public. If capital was not forthcoming to start the necessary industries, the government would undertake them, and later offer them at public auction to private business. 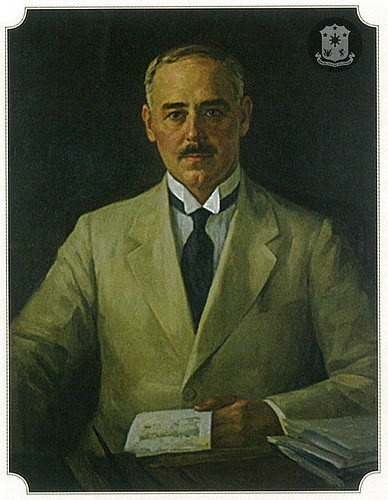 President Quezon spoke well of Foley of the Philippine National Bank and of Yulo. Said he (Q) was informed of a lot which goes on, because he has three agents in Tom’s Dixie Kitchen; that he knows all the racketeers in his Government, and will outwit them. He added that he was going to direct only the policies of the government, but I wonder? An hour and a half with Foley (New York manager of the Philippine National Bank) over the Manila RR. bond purchase –his ideas and mine are very similar but he looks on it chiefly from the point of view of a banker, while I can, perhaps, see better the government policies involved. He predicts a change in the management of Philippine National Bank here and says Miguel Cuaderno, and perhaps Corpus, must go. Foley advocates the issue of 5 million pesos of Philippine Commonwealth 5% bonds, to establish the government’s credit; says the whole issue can be supported by the Philippine National Bank in New York. Would like to go home via Europe and feel out the situation in Switzerland, France and England on this bond issue, and says also that while in London he can drop a few hints to Scott and Priestley that they should make a better offer on Manila RR. bonds. One hour with A. Roces, Sr. in Vanguardia offices; he seemed glad to have me act as intermediary between him and Quezon. Appeared surprised when I showed him the two offending articles; said he had not seen them, and would correct the misstatement; he is about to become “dictator” of all his editorial policies –re-news his intention “without reservation” to support Quezon. Dis-approved of Quezon’s visit to the bandit country but had not commented on it. He was very cordial and friendly, and expressed pleasure at my appointment as adviser –but said it should not have been confined to communications, but have been general. Said he would make an appointment for me to talk with Manuel Roxas tomorrow.